File Encryption, Folder Encryption, Compression, File Shredding all rolled in one package. No need for other security tools, this one does it all. Offers 448 bit encryption and very high compression.Secure IT File and Folder Encryption Software allows you to encrypt file, folder, any type of data against unauthorized viewers. Secure IT uses a non-proprietary, open source, public domain encryption algorithm, Blowfish, at a key strength of 448 bits. Blowfish is one of the strongest cryptographic algorithms in existence. Also supports AES encryption algorithm, the new official US government standard. When files are deleted within the standard computing environment, they are not completely removed from the hard disk. Only the file information is removed from the File Allocation Table. There are several commercially available software packages that can then be used to 'undelete' or recover data. This can lead to serious breaches of security. Secure IT has an integrated file shredder module that removes all traces of data. Allows for the creation of self extracting encrypted files. The recipient need not have Secure IT installed to decrypt the files, all that is required is the password. Send zipped and secure email attachments. DeCypherIT is a freeware utility. This utility allows you to decrypt encrypted files generated by Cryptainer and Secure IT. Click here to download DeCypherIT for free. Powerful command line processing available for encrypting and compressing at the dos prompt. Group a series of encryption and decryption commands in a single or multiple batch files. To minimize the learning curve, and make the product easy to use. Designed to hide the complexities of encryption. Encryption made as easy as ABC. Statistically impregnable against brute force attacks. It would take more than the age of the universe for all the computers in the world working simultaneously to decipher a Secure IT encrypted file. Secure IT is fast, and requires relatively few computing resources and little time to encrypt files. In practical terms, a 1 MB file can be encrypted in a second or two on most desktop machines. No unauthorized access to encrypted data is possible under any circumstances. There is no special procedure, secret code, or hidden entry method to fall back on. 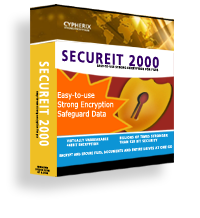 Secure IT encrypts files from any application, whether spreadsheet, graphics, word processing or any other; on every kind of re-writable media, whether floppy disk, removable hard drive, zip drive, tape drive or other. Recommended system requirements are - X586 systems or better with 32 MB RAM running Windows XP, Vista, Windows 7, Windows 8, Windows 10.